Martin Luther introduced the character of Hiram Abif to the popular imagination when he translated the Bible into German. Luther translitered three Hebrew letters in 2 Chronicles 2:13 to form the name, Abif, rather than translating them as in the Latin Vulgate, "misi ergo tibi virum prudentem et scientissimum Hiram patrem meum". Hiram Abif is described as the son of a woman of daughters of Dan ("Dan shall judge his people" blessing from Jacob in Genesis 49:16) and his father was a man of Tyre. He was skilful to work in gold, and in silver, in brass, in iron, in stone, and in timber, in purple, in blue, and in fine linen and in crimson. He was sent to King Solomon by Hiram, King of Tyre before the building of the Temple at Jerusalem commenced. Anne Boleyn persuaded King Henry VIII to order that every church in the realm should have a Bible translated into English, chained to a bookstand for public reading. These printed Bibles were based on translations of William Tyndale and Martin Luther and the legend of Hiram Abif was born. The English Cathedral's in which these Bibles were placed were often constructed over many decades under the supervision of successive Architects, who were often buried there. In the popular imagination, King Solomon's Temple resembled an Englsh Church and was the expected burial place of Hiram Abif, its principal Architect. 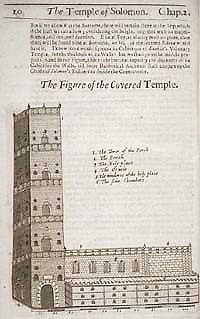 This very English interpretation for the design of Solomon’s Temple was presented by the Puritan divine Samuel Lee in Orbis miraculum; or, the Temple of Solomon Pourtrayed by Scripture-Light published in London in 1659. Scholars and translators continue to discuss the meaning of these three Hebrew letters. Some have suggested that "Hiram Abi" may be a local variant or misreading of "Hammurabi", others that as it was common for Kings to refer to themselves in the third person, the translation could read: "Now, I have sent an artisan who understands wisdom, who has worked for Hiram (myself), and for my father. . ."
The bronze pillars at the entrance of King Solomon's Temple were cast by Hiram, a widow's son from the tribe of Naphtali (Naphtali's blessing from his father called him "a running deer" Genesis 49:21). His father was a man of Tyre. If the Hiram, who cast the bronze pillars, was the son of Hiram Abif, then his father died before he arrived in Jerusalem after the completion of the building of the temple. Josephus claimed that both references are to the same man, Hiram whose mother was from the tribe of Dan and whose father was of the stock of the Israelites (from the tribe of Naphali), but who lived in Tyre. Josephus may have been attempting to place both Hiram Abif and himself among the great men of the past, who had been educated at the courts of foreign kings; Joseph, Moses, Zerubbabel and Ezra. The Temple at Jerusalem resembled the traditional Phoenician design: an outer hallway, a central court, an inner holy of holies, and two pillars outside the front entrance. Excavations of the 13th century BC temple at Hazor and the 9th century one at Tell Tainat show this pattern, as well as the Phoenician temple at Cadiz, that was still standing during the first century AD. and that the multitudes of the earth may understand . . . Skill in the use of dyes was the basis for the wealth of the ancient kingdom of Tyre. The most expensive dyes were obtained from Murex sea snails, and produced shades of color from purple to sky blue depending on exposure to sunlight. In nature the snails use the secretion as part of their predatory behaviour and as an antimicrobial lining on egg masses. The snail also secretes this substance when it is poked or physically attacked by humans. Therefore the dye can be collected either by "milking" the snails, which is more labour intensive but is a renewable resource, or by collecting and then crushing the snails completely, which is destructive. This species lives in the Mediterranean Sea and the Atlantic coasts of Europe and Africa, specifically Spain, Portugal, Morocco, and the Canary Islands. The descriptive phrase "Wine Dark Sea" first appears in Literature in the Iliad and is also used four times in the Odyssey. It evokes an image that has carried on for millenia in literature and imagination. Blue is the color of the sky and was produced when the dye from Murex sea snails was processed in sunlight. It was long associated with the Order of the Garter, until after 1745 when a darker shade of blue was adopted. Crimson was the color produced using the dried bodies of a scale insect, which were gathered commercially in Mediterranean countries, where they live on the Kermes oak, and sold throughout Europe. Crimson was the color associated with earth. 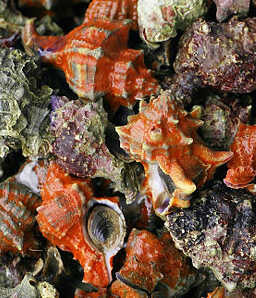 Purple is the color produced when the dye from Murex sea snails was processed in the shade. In classical antiquity, purple exceeded all colors in costliness and superiority of its delightful effect. Purple is was the color of harmony, a combination of blue and crimson and represented the sea. This word was introduced into the English language during the century of religious and political turmoil, that followed the printing of the first officially approved English Bible. An allegory is a narrative in which the characters are personifications of abstract moral qualities. The Pilgrim's Progress by John Bunyan (published February, 1678) is the most famous allegory in English literature. An allegory explains itself and requires no previous explanation or agreement about its significance. The allegory of Hiram Abif in freemasonry is therefore to be understood in terms of the moral qualities personified rather than by reference to any particular historical characters. A number of historical figures may have inspired an allegory about a person whose untimely death occurs before their life's work is completed. William Tyndale met an untimely death in 1536 before his translation of the Bible into English was completed. Thomas Cranmer met an untimely death in 1556. The untimely death of William Schaw in 1602 was mourned by Operative Masons in Scotland and he was buried within Dumferline Abbey. Pehaps even Sir Christopher Wren who was buried in St Paul Cathedral with the epitath, "Underneath lies buried Christopher Wren, the builder of this church and city; who lived beyond the age of ninety years, not for himself, but for the public good" and whose later life was not without criticisms and attacks on his competence and his taste may be the inspiration.